Programa de O "Satellite Antenna Alignment" é usado para calcular os ângulos necessário para louças de instalar de satélite. 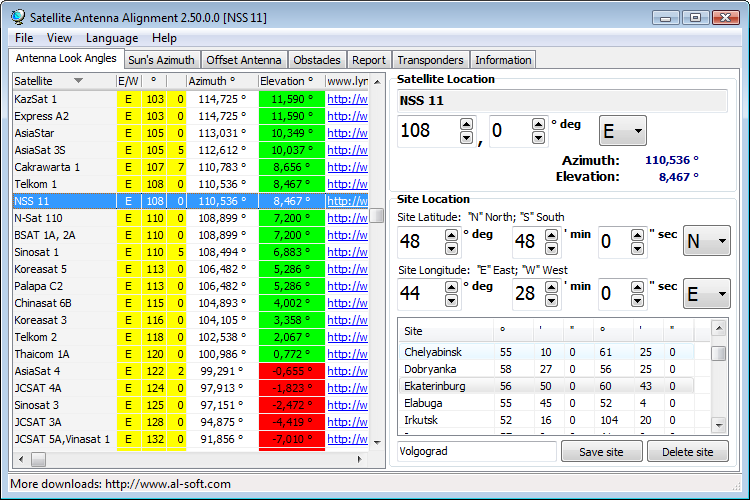 The program "Satellite Antenna Alignment" is used to calculate the angles necessary for installing satellite dishes. The main difference from similar software is the possibility to calculate the position for all satellites at once. Thus, you get a clear picture about what satellites can be physically visible from the location where the dish will be installed. Additionally, the program has a mechanism for calculating the azimuth of the sun and you can do everything without a compass now! More info: http://www.al-soft.com/saa/satinfo.